In years past, marijuana growers haven’t been invited to the event. Now, Duane Sinning, the state regulator in charge of industrial hemp is introducing three cannabis company executives. “There’s an opportunity where traditional agriculture can help an industry emerge in this state,” Sinning said. Because cannabis is the state’s newest and flashiest cash crop, there’s a focus on finding the best, and most efficient ways to grow it. A focus to turn cannabis into a full blown commodity like wheat or corn. Brooke Gehring sat on the panel. She’s the CEO of a chain of cannabis shops in the Denver metro area called Live Green. “Farmers understand scale. They understand hardship. They understand you’re only as good as your last crop,” Gehring said. Stephen Lipton knows those lessons. He’s the cultivation manager at The Farm, a recreational and medical marijuana operation in Boulder, Colorado. Before growing commercial-scale cannabis, Lipton worked as an organic farmer. 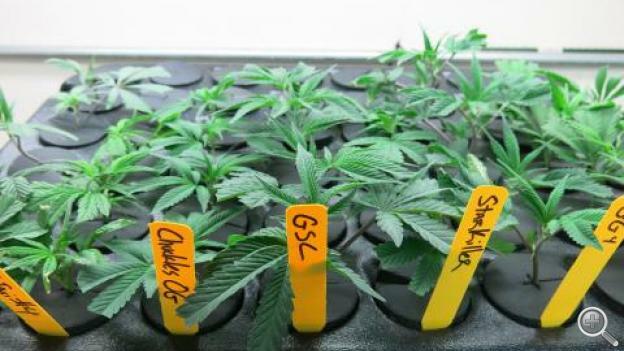 His research lab is filled with at least 150 different strains of marijuana, planted in small pots. Just like a plant breeder attempting to make a sweeter apple or a hardier tomato, he crosses strains in search of the perfect variety. “Plant vigor, smell, aroma, taste, anything that you can imagine really. Yield. Yield is a big one for sure,” Lipton said. Most of modern agriculture relies heavily on inputs, like fertilizers and pesticides, to keep plants healthy and productive. But for obvious legal reasons, the Monsantos and John Deeres of the world aren’t catering to cannabis growers. That leaves room for start ups. Colin Bell decided to use his knowledge of soil microbes to serve the marijuana sector. Bell originally developed a soil additive for vegetable crops at Colorado State University, but now sells beneficial bacteria by the gallon to marijuana growers under the brand name Mammoth. And more yield translates to more money. In Colorado alone, marijuana sales were just shy of a billion dollars in 2015. And more markets are coming online. More than 20 states have laws allowing industrial hemp and medical marijuana, and four states plus Washington D.C. give permission for recreational use of the drug. With a handful of states expected to fully legalize this year, Bell says a lot of farmers want in on the ground floor. That same excitement is on display back at the Governor’s Forum on Agriculture in Denver. Grant Mattive farms potatoes and barley in the state’s parched San Luis Valley. Last season he gave hemp a try. In a region prone to drought, he likes the crop’s ability to withstand dry conditions. “To be successful and to get this industry really going on its feet, we need to involve farmers a little bit more, rather than just the basement weed growers,” Mattive said. At first, Mattive says he was skeptical about jumping onto the bandwagon, in the rush to grow cannabis. Now, he says he just needs to figure out how to run his combine over it.